Laptop manufacturers are about to be able to start putting Samsung's 4K OLED panels into 15.6-inch systems. Samsung Display has shared that mass production of its latest OLED panel will begin in February. Once production lines crank out large numbers of displays, premium laptops will begin to make use of the panels. One of the major benefits to OLED is offering a high contrast ratio while also offering relatively high brightness, making it an excellent technology for HDR. 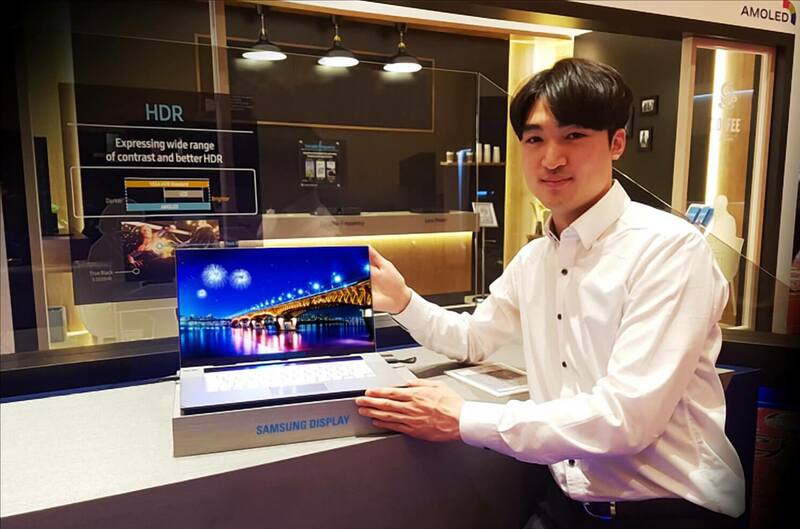 Samsung's UHD OLED panel for laptops can range from five ten-thousandths of a nit on up to 600 nits of brightness. Color space is also better represented by OLED. Samsung's laptop panels will offer twice as many colors compared to traditional LCD displays at 34 million. For those familiar with color mapping, the DCI-P3 color space is Samsung's target to meet or exceed. Reduction in blue light output during everyday use is also a claimed benefit of the 4K OLED display. OLED panels are still not perfect replacements for LCD though. Greater efficiency and more pleasing appearances are wonderful, but can quickly be overshadowed by problems such as burn-in. Longevity of OLED panels has also been questioned in the past, but Samsung's track record of producing quality displays speaks for itself. 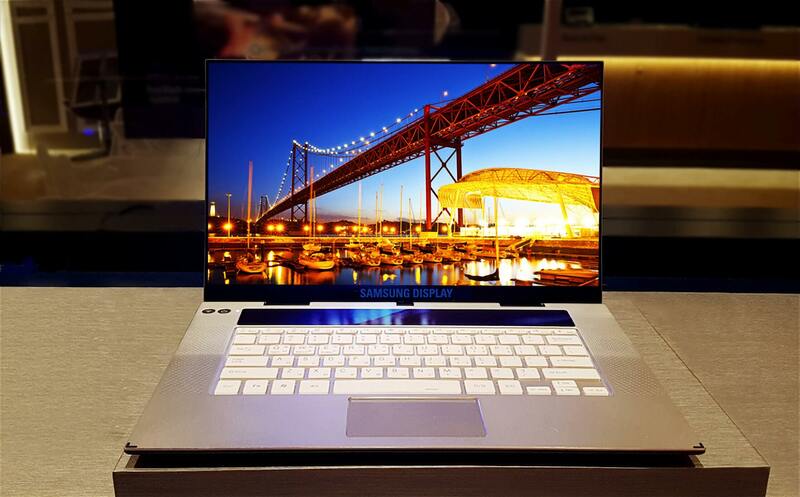 Although we do not know which manufacturers will specifically be using Samsung's OLED panels, there were several laptops at CES 2019 that contained OLED displays. HP is building its Spectre x360 2-in-1 with OLED and Dell is adding OLED options to the XPS 15, Alienware G Series, and Alienware m15. HP will launch its upgraded Spectre laptop in July, while Dell is planning to release new laptops as early as March. I can't imagine that current laptops - especially gaming laptops - have owners who are disappointed with their visuals. You push for 4K displays, but now you need a faster, more powerful GPU to run it - which coincidentally uses more battery. The vast majority of laptop displays, ESPECIALLY gaming ones, tend to have horrid color reproduction/contrast (mostly in the pursuit of refresh rates). You have to specifically find laptops with good color reproduction if its important to you, and it greatly limits your choices. A decade ago maybe, but not today. I know a gal whose job includes testing and troubleshooting displays for use in digital art and layout which usually require perfect color matching for printing. She's never once mentioned this issue. In fact she has told me that mid-range laptop displays from top-tier brands are actually BETTER than most monitors targeted at the same buyer demographic because their produced in much larger quantities, which reduces cost. High-end laptop video has been focused on color reproduction and sharpness for a long time now since there is no point trying to compete on refresh when 95% of PC gaming is done on full size machines. Meanwhile the OEMS try to gouge on desktop monitors because there is an assumption that a bigger stand-alone display will be of higher quality in every respect, not just frequency. This display alone could cost hundreds of dollars. Probably for laptops worth thousands of dollars. I d still love to have a 27 inch oled monitor although I know that at this size this device would be something I would never justify buying. Charles Olson and Greg S like this. This is the kind of laptop I would buy with a 3700u in. Just wondering any ideas on when or if ever 24' or 27' 1440p OLED monitors coming out? Burn-in on monitors is going to be crazy - imagine the always-on taskbar. How about a 32" OLED TV? or 13" OLED laptop? or a 24" OLED Desktop monitor? The 2019 LG Oleds use HDMI 2.1 and natively do 120hz 4K HDR with 13 ms AND adaptive sync. They also have a full CMS And auto game mode. Computer monitors are ****. You know what I do to avoid that? 'Cause I'm hyper aware of this potential issue too... I just set my wallpaper to - wait for it.... ALL BLACK!! And my taskbar to... (you guessed it!) AUTO HIDE!! I agree, OLED seems to be the future (well, at the moment). I've been researching TV's lately, the LG OLED's seem to be top of the heap, incredible blacks, no reports of burn-in. Fantastic picture. They will be printed via inkjet technology - which, IMO, should bring production costs down substantially.